Doctors have carried out the UK's first successful beating-heart transplant. The recipient, a 58-year-old man who received his new heart two weeks ago at Papworth Hospital in Cambridge, is said to be doing "extremely well". The new technique involves keeping a donated heart warm and beating throughout the procedure, rather than packing it in ice for transport. One expert told BBC Radio 4's Today programme it could "triple or quadruple" the number of transplants. The process gives doctors more time to get hearts to the recipient. 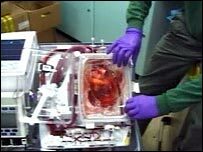 Donor hearts are normally given a high dose of potassium to stop them beating and are packed in ice which helps to keep them in a state of "suspended animation". But there is only a four-to-six-hour window for the organ to be transplanted into the recipient, which could be a problem if a heart becomes available in a remote area - many organs in the UK are transported by road. Under the new system, doctors hook the heart up to a machine which keeps it beating with warm oxygenated blood flowing through it. This gives doctors time to examine the heart for any damage and the chance to better match the organ with a recipient. The heart can be kept outside the body longer and reaches the transplant patient in much better condition. The transplant was done as part of a European trial. Researchers plan to carry out another 19 operations in Germany and the UK. Professor Bruce Rosengard, who led the team carrying out the transplant, said the operation was a success, the heart was working well and there were no signs of rejection. "Normally the heart is in suspended animation [on ice] but they still start to deteriorate. But once hearts are hooked up to the device, which takes about 20 minutes, any deterioration is fully reversed. "The goal of this trial is to demonstrate that this is at least equivalent if not superior. "The next step will look at hearts that are not good enough for transport currently - we hope we can render more hearts usable." He said the technique could raise the number of potential donors by at least 50%. If the technique proved successful in resuscitating hearts that were currently unusable the number of transplants could be tripled or quadrupled, he added. In 2004/05 115 heart transplants were carried out, 15 patients died while waiting for a donor organ and 54 patients were still on the waiting list. Chris Rudge, managing and transplant director of UK Transplant, said: "I am very pleased it has gone well on this first occasion. "It is a major issue that the time a heart can be stored between taking it from the donor and transplanting it into the recipient is short... so anything that extends that time and allows the procedure to be organised more thoroughly is to be welcomed. "In the longer term it is not just hearts that can be handled by such systems but other organs too, particularly the liver." The British Heart Foundation's medical director, Professor Peter Weissberg, said: "For many very ill heart disease patients transplant is still the best option. "We hope that this new technique will prove successful in more patients, so transplant teams can look further afield than they currently do for suitable hearts." And Professor Stephen Wigmore, professor of transplant surgery at Queen Elizabeth Medical Centre in Birmingham, said the new technique had many benefits. "There's reduced pressure on the need to make an immediate decision, increased time between removal and transplant, it allows evaluation of the organ outside the body and the organ is kept at body temperature so it should function better."